In the pictures below, the track is mounted to a permanent structure (wall, post, etc.) using three large lag screws. The Finch Windmill is most effective when mounted in the home of the athlete because the athlete is more likely to use it. If you want to take the Finch Windmill with you when you travel, you can use the "hose clamp mounting method" (see description below) or buy an additional track ($40.00 extra charge). 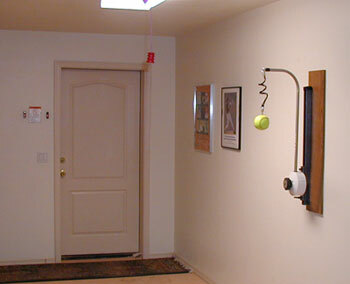 Instead of permanently mounting the track to a wall (see permanent mounting method above), the use of two hose clamps allows you to take the Finch Windmill with you and attach it to any pole. Finch Windmill Copyright . All rights reserved.